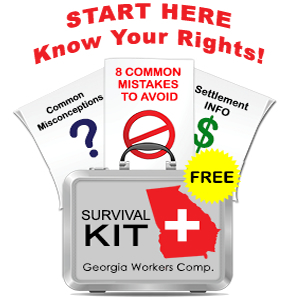 Georgia’s workers compensation law provides that an employee injured on company time while performing job duties is automatically covered by workers’ compensation. Claims accepted by employers and their insurers are called “compensable claims,” and include both lost wage benefits as well as medical care. While Georgia’s workers’ comp. system should work smoothly, in reality, it does not. Most employers evaluate every claimed job injury critically and look for reasons to deny those claims. Workers compensation insurance costs money and human resource managers look for reasons to deny claims. Employers often deny work injury claims by arguing that the employee’s injury was a “pre-existing condition,” or that the injury reported did not happen when the employee was at work. The “injury did not happen at work” defense is especially common when the employee’s accident was unwitnessed. If your job duties require you to work on your own or in small groups, you could find yourself fighting an insurance adjustor who does not want to pay your claim because she assumes that every work injury claimant is dishonest and that every unwitnessed accident will likely result in a fraudulent claim. How, then, do you protect yourself? First, you should seriously consider consulting an attorney as soon as possible. Timing is crucially important in unwitnessed accident cases and you will benefit from the guidance of counsel. generally the more detail you can provide, the better, especially if that detail is confirmed by other evidence. For example, if you state that you called your supervisor at 2:15 pm and cell phone records document a call from your number to your employer at 2:13, your credibility will be enhanced. If, however, you state that you called your supervisor at 1 pm on a Thursday, but the cell phone records show a 3 pm call on Wednesday, your other statements will seem suspect as well. Recognize that the severity of some injuries may not be immediately apparent. For example a serious back injury may start out as a mild ache, but the next day or next week, you may not be able to get out of bed. You should treat every injury as being potentially serious. Minimize physical activities and exertion around the house after your accident. Workers compensation insurance companies frequently hire private detectives to conduct surveillance with video cameras. An innocent game of H.O.R.S.E. with your children can be used against you. did not Occur at Work? Sometimes, even if you are telling the truth, insurance companies will still deny your claim because you may not have the evidence you need to convince a judge. This is not right nor is it fair, but this is how the system works. On the other hand, insurance companies are in the business of managing risk. A judge could find in your favor and thereby subject the employer/insurer to penalties. Georgia workers’ comp. law allows employers and employees to settle disputed claims using something called a “no liability stipulation.” In a no-liability stipulation, the employer/insurer denies that they are responsible for paying benefits and that the injury arose out and in the course of your employment. They also agree to pay you a lump sum to resolve any claims you may have. Usually the employer will also want a job resignation. As noted earlier, I strongly recommend that any employee injured in an unwitnessed accident should seek legal counsel because unwitnessed accident claims have the potential for many problems.